Copyright © 2015 by George M. Bonnett, JD. All rights reserved. No part of this publication may be reproduced or transmitted in any form or by any means, electronic or mechanical, to include photocopying and recording, or by any information storage and retrieval system, without prior permission in writing from the author. Select View then Text Size or Zoom to change the way this manual appears on the screen. If you see the message "Windows (8) protected your PC" - Click on the "More info" line then on "Run anyway" to continue with the download. As an alternative we invite you to visit Inside REC-TEC, the Manual and Tutorial for the program, posted on our website for anyone to use. It goes into detail covering just about all of the available options for every module in the program and contains hundreds of screen images. 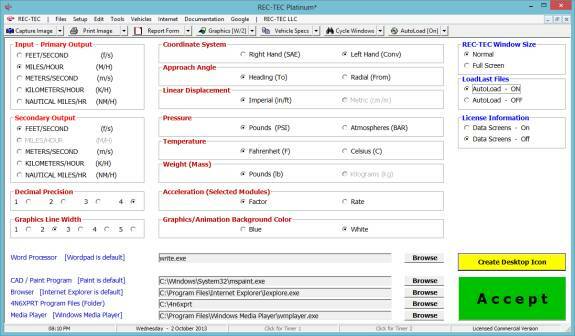 Either option will let you explore the power of REC-TEC enabling you to decide if it will assist not only you but others, towards a better understanding of the physics governing the collision events. 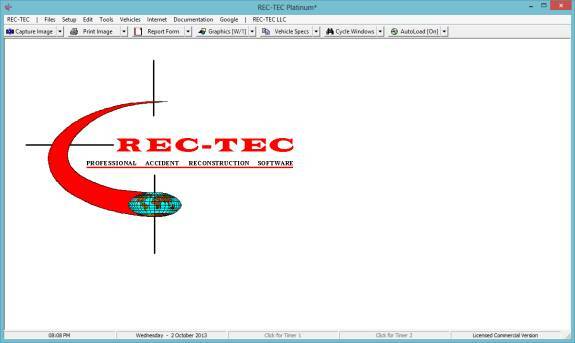 From there you will download the latest copy of the REC-TEC program. If you have previously downloaded the program, it is suggested that you remove the RECTEC folder and start from scratch. It is very strongly recommended that you place the RECTEC folder in C:\Program Files, thus creating the C:\Program Files\RECTEC folder. This will eliminate confusion in the future. The new Installation will try to start the program as an Evaluation copy unless you deselect this option on the WinZip Self Extractor. When the program Starts, it will display several messages (Trial copy only) before bringing you to the white Configuration Screen. You will see a Yellow button to make a REC-TEC Icon. You can use it now to set up an Icon which will point to the program. 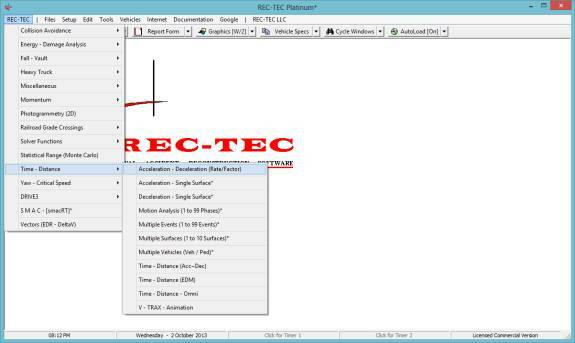 The Configuration Screen can called by going to Settings > REC-TEC on the top line of the REC-TEC program Window. 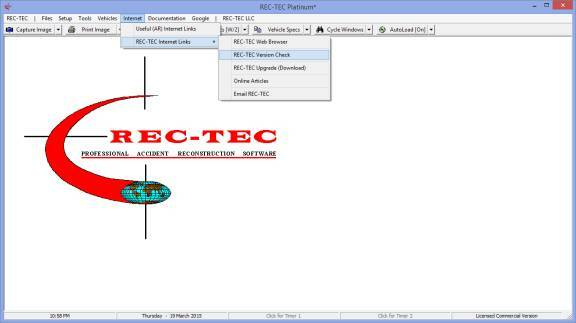 When REC-TEC is started, it may ask for your Name, Password and Status Identifier depending on your security track. That information will be given to you or sent separately in an email if applicable. Each part of this information must be entered in the specified block exactly as they appear in the email or packet given to you. Once REC-TEC accepts the information, your name or the name of your Department will be shown and the program will reset to REC-TEC Platinum. If the Name and Password are entered correctly (use Copy and Paste from the Email), your License Name will appear on the top line near center-right of the REC-TEC Window. If the program fails to function as described, it will be necessary to delete the folder and try again from the beginning. If it fails a second time, contact us by email or phone. Once the program is licensed and running, Copy the entire folder to your other USB drives and computers. Set up the Icon (Settings > REC-TEC) on the computers - Use "Run_REC-TEC.bat" on USB drives. 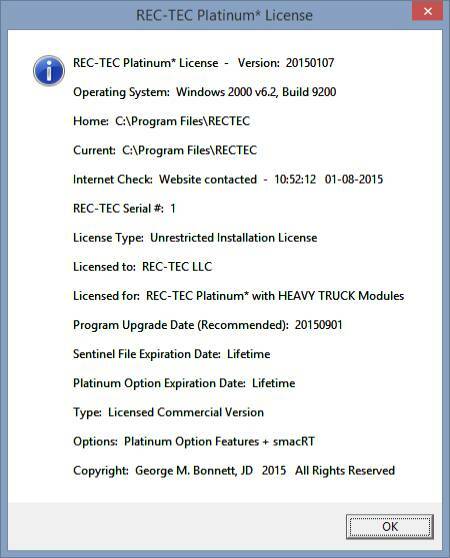 The download file (RTProVE.exe) may be "run" from the website, automatically starting the extraction process. With newer versions of Windows, it will be necessary to Right click on the Program Icon and select Properties at the bottom of the Dropdown Menu. Go to Properties. Go to Compatibility. Near the bottom under Privilege Level check the box to "Run this program as an administrator." Check OK. Close the window. Note: As an option, in Windows explorer go to C:\Program Files\RECTEC and open the folder. 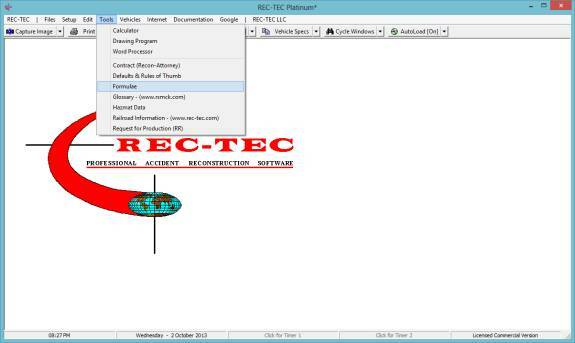 Place your cursor on RECTEC.exe (application with REC-TEC Icon) and right click. Go to Properties. Go to Compatibility. Near the bottom under Privilege Level check the box to "Run this program as an administrator." Check OK. Close the window. If you have a problem with Windows 7 or Windows 8 trying to place files in a library, unzip the files to a USB drive (N:\RECTEC - where the N is the Drive Letter of your USB Drive). Copy the entire folder to C:\Program Files. 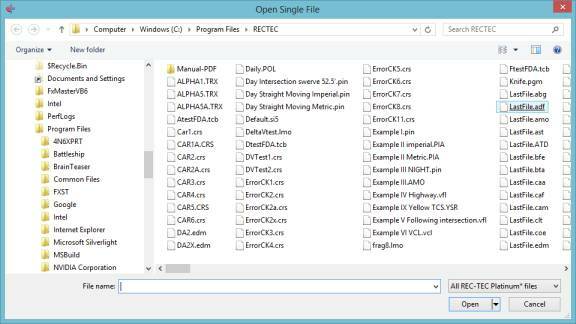 If WinZip generates a message that it is unable to create the output file, it means that a copy of REC-TEC is currently running. It will be necessary go to Windows Task Manager and End all running copies of REC-TEC, or simply reboot your computer to terminate the running copy. In My Computer select the specific drive (C:)>Tools>Folder Options>View. Uncheck the block "Hide extensions for known file types"
Google "Disable Windows Libraries" and find out how to Disable/Enable this function in W7 and W8. The easiest way is to just hit the Print button in REC-TEC and print the page in either "Portrait" or "Landscape" mode. 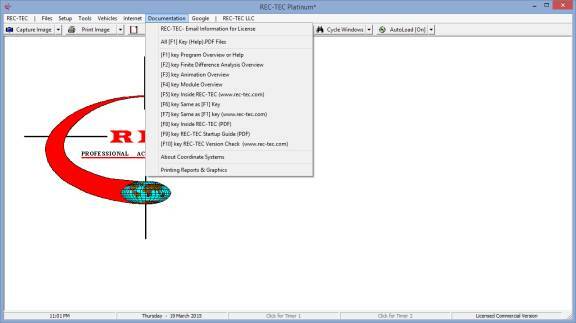 Below you will find the Help screen for printing from REC-TEC. The process is easy and flexible to suit your needs. 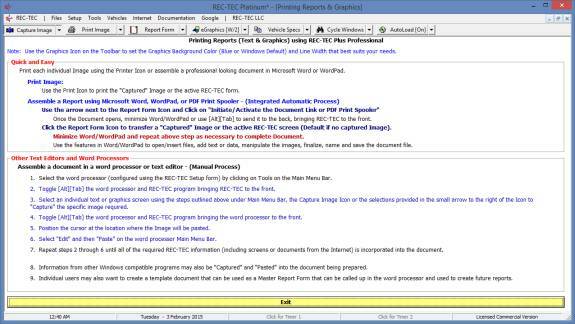 The Capture feature within the program or [Ctrl][Prt Scr] will capture the image of the screen. This image can be "pasted" directly into a word processor or it may be pasted into paint and modified before being selected, copied and pasted into the word processor. 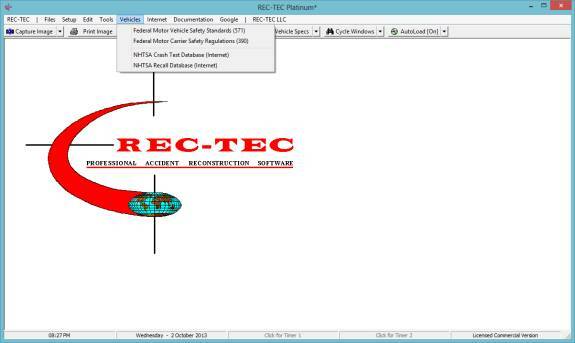 Use the drop down menu by clicking on the REC-TEC button (upper left of the screen) and select the basic type of problem. If Time/Distance is selected you have several choices. For the example here we will use a Single Surface Deceleration problem, By clicking on this selection a Deceleration Single Surface form is called up. Data may be entered into the blank form or one of the saved problems can be called up using the "Open .TDD file" button in the lower right of the screen. If entering data into the blank form the program will try to assist as to what information is needed. Once the program has sufficient information to develop a solution it will be displayed usually to the right of the entry inputs. The TDD (Time Distance Deceleration) form can display additional information if a Lateral Distance is entered. As you will soon see, REC-TEC treats your computer as a computer by determining as much (solution) information as possible for the data entered. Most other software programs require the user to pick a formula and then their program treats your computer as a (very expensive) calculator. REC-TEC takes the information that you have and develops a solution and in may sections will display the formulae employed in arriving at a solution (Click on the Formulae* button). 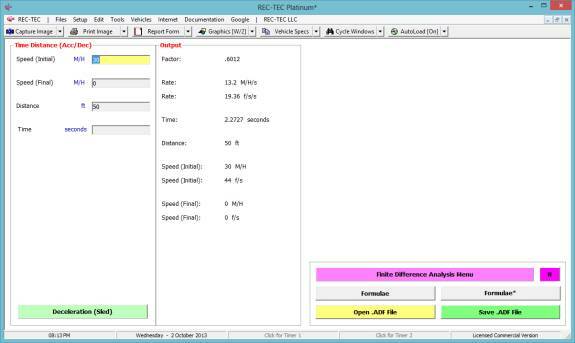 Many of the features in REC-TEC are on the cutting edge of accident reconstruction and some may be far beyond that covered in basic Accident Investigation, Accident Reconstruction and Commercial Vehicle classes. Please see the Classes section for additional training opportunities. Inside REC-TEC is a comprehensive Training Manual and Tutorial available from our website. It contains detailed explanations of the inputs and outputs of every module in the program along with worked sample problems to assist the user in getting familiar with the module. It uses several problems in each section to illustrate the functionality of each module. Inside REC-TEC is as close as you can get to having an instructor available at the touch of the F5 key from the program. Inside REC-TEC can also be called up independently from our homepage, even with a smartphone. 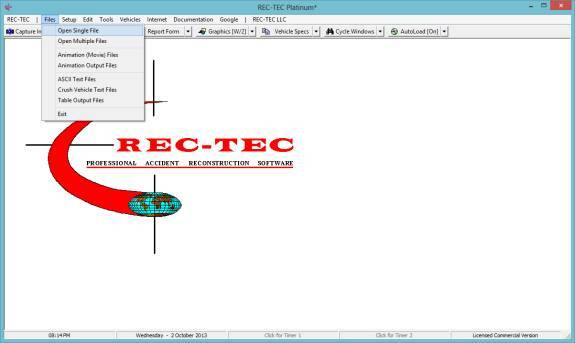 REC-TEC also has a built in Manual accessible using the F1 key in any section of the program. Please check out the On-line Articles which were designed to let you get the most out of our software. REC-TEC can work in any Imperial/Metric (or hybrid) system and can be switched between systems at any time. Some of the content may not apply to your particular version. It will assist in becoming familiar with the various modules, and show how the program can solve very different, difficult, and complex problems. The Training Manual and Tutorial uses a step-by-step approach to REC-TEC accident reconstruction. It is not intended to teach the basics of accident reconstruction, but to assist the accident reconstructionist in solving problems using REC-TEC. Before we begin to work problems, it may be beneficial to take an in depth look at the main screen and take a tour of the many features to get a better understanding of the functionality of the program. The F1 – F5 keys will now work from the Main screen. 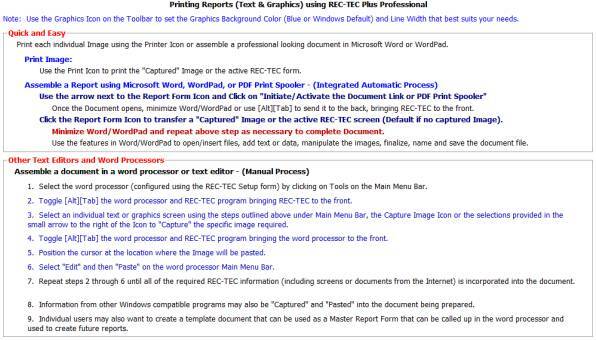 The F5 Key will call this document from the REC-TEC web site. Opening a module – At the REC-TEC pull down menu (top navigation bar – left side), select Time - Distance then Acceleration - Deceleration (Rate/Factor) from the submenu (Figure 4). We need to learn how to accelerate and decelerate. These are much the same and often just referred to as Accelerations. A deceleration is a negative acceleration. While this sounds very simplistic, it will help us get through one of the most difficult areas in learning how to use REC-TEC. It is often said that Time-Distance is the heart of Accident Reconstruction. It is the foundation of Accident Reconstruction. The cornerstone of this foundation is Acceleration. If Acceleration is understood, Reconstruction becomes much easier. Almost all Time-Distance problems that ask for the Input of a Factor can be solved using Time Distance Single-Surface Acceleration (Module 2). They could also be solved using Time-Distance Single-Surface Deceleration (Module 3). Time-Distance Omni (Module 8), will solve for Accelerations, Decelerations, Constant Velocity, and Acceleration (and Deceleration) Factors. So why confuse everything with so many different modules? 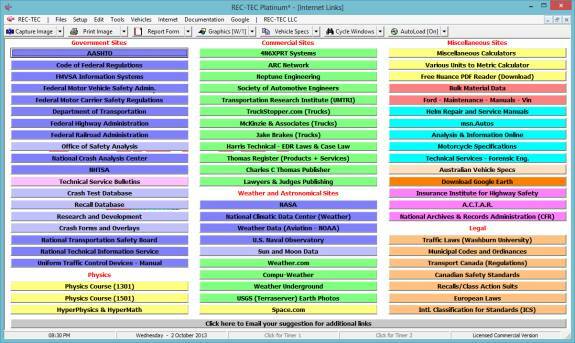 It may help to think of REC-TEC as an Accident Reconstruction Toolbox. Each of the modules in REC-TEC is a unique tool designed for a special purpose. While it is possible to drive a nail with a wrench or a screwdriver, a hammer is usually more efficient. And just think of all of the specialized hammers some stores carry.